My current waist training student Ashlee (now in her ninth week of training and staying the course!) raised a good question last night to which my newest student, Carl, contributed with his experience which also echos mine. When should one eat, if one prefers to exercise early in the morning? Your experience with exercise and not eating beforehand leading to huge hunger during or right after, mirrors my experience to some degree. My main form of exercise is to use my treadmill. Because of my work schedule I usually exercise in the morning. When I first started, I tried to use the treadmill shortly after getting out of bed but before I ate anything (had breakfast). Big mistake. I soon learned that doing that was pure torture. I had no energy and could barely make it through an easy workout. My answer to Ashlee had been along the same lines. One of the goals during training is to avoid like crazy, crash hunger pangs that force us into binge eating. When I request students to divide up their portion of food into 8 meals during the day, and to always eat breakfast during three months of training, I mean that as one strategy to avoid binge eating. What I had apparently not clarified with Ashlee, is that the first of eat meals, breakfast, should be the first thing you eat when you get out of bed as soon as you can, especially before exercising. I know this might be difficult for those who take a bit of time to warm to a new day and whose tummy seems to rebel at eating early. However, there must be some challenge and some difficulties to overcome during training to make the effort feel worthwhile to most students as well as to reach their goals, and this is one practice that I must insist is worth the trouble to do follow. I concur with Carl that eating protein in the key here, not necessarily eating carbs or even complex carbs, tho it’s true that complex carbs/fiber take longer to empty out of the tummy and accordingly, decrease our hunger. When I exercise without eating a bit of protein about 30 min. before I start, during exercise I find a wave of hunger overtaking me, just like Ashlee. So what kind of protein might one eat early in the morning and how much? I like Carl’s suggestion as cereals have some protein, however my preference is two or three Triskets (low fat low sodium best of all) with about 1 level teaspoon or less of peanut butter spread on top (unless you have a peanut allergy). If I want a bit of sweet then I’ll add about four raisins per crackers or perhaps dried blueberries or cherries. I also sometimes eat a slice of turkey or slice of meatloaf or beef or pork roast (round cuts are always less fatty) before I exercise. If you are into cooking then a 1/2 slice of bacon with oil drained and pressed out with a paper towell, is also fine so long as not prepared every single day. Cut those slices in the bacon package in half and you’ll soon be surprised how satisfying it is to eat only one half slice whereas you used to scarf down two pieces routinely, right? Remember what I learned from Dr. Dean Ornish that it is the very first bite of any desireable food and flavor, that delivers about 95% of the flavor and satisfaction punch. Think on it and I think you will agree with him. Thus each bit more that you take delivers less of an impact as you go. Why waste valuable calories imbibing foods that don’t really satisfy you? Food should be pleasurable to the max and that’s why I don’t advocate denial as an effective method of weight reduction or waist training. You do not have to give up foods or taste sensations you cannot live without,m but what you must do during trainnig is stretch the pleasure out and increase the impact by slowing down the time it takes to eat the item you desire, in order to savor every bite. That’s also part of the reason I require students during their first two weeks of training to chew every bite of food 30 times before swallowing (yes, including ice cream–yes, that is “food”, right?). It’s a ridiculous practice to be sure and most often does not work well but if you have to force yourself to hold back swallowing to keep chewing and chewing…and chewing…you will soon begin to replace old unhealthy habits of bolting down food leading to overeating and less pleasure, with much better ones. That’s my take on it. What kinds and quantities of food stave off hunger pangs for you during and after exercise, and just how important is eating breakfast to you? I was making my morning steel cut oats and cafe presse coffee (yummie! Try it if you have never used a glass coffee press) and listening to my normal morning news show GMA, when my attention was caught by the above phrase in a commercial for the retail store, TJ Maax. Now isn’t that a classic example of the “gotta have it, gotta spend money NOW, gotta move on to the next season’s fashions” mentality? The commentator was encouraging us to go out and buy the “latest.” Which reminded me that the purpose of fashion is to sell clothing and thus, “they” change styles every season to make us want something new, and feel like we will look out of date if we don’t. Appreciating corsets requires a mentality and approach that is 180 degrees opposite the above viewpoint. While seasons for clothing seem to change every four months with new lines coming out of Paris and Milan, or visible at your local Target store, a good custom corset from ROMANTASY will typically take about two months to produce, and easily can take up to four or more months to produce. That’s because we don’t job out any part of corsetmaking and the corsetiere you choose is the same person who will lovingly hand-craft your order in a small home workshop. Some of our team members work only part-time on corsetmaking, and all of them have their own private clientele as well as our clientele. A good corsetiere is very much in demand for the discerning client, and others have placed orders before you, so there is always a production line in effect during most times of the year. Sometimes family or personal health emergencies call them away even from part-time work, and that’s why we ask for our clients understanding and patience which we promise to reward with top quality and satisfaction for many years to come. Many corsetieres working today also work alone, don’t employ assistants, and don’t have secretaries to source and order materials. But no matter how long it takes, your corset will surely NOT be out of date when you receive it. Infuriating answer, right? Especially so for those seeking easy, quick answers (which are not compatible with corseting and good quality). The rule of thumb we like to use is that if you wear a tight-lacing corset 23.5/7 and lace down about 4″, then it will most likely wear out in about a year more or less. What do I mean by “wear out”? Based on information we have gathered over our 22 years in business, most likely bones will begin to push downward and cut through threads securing a binding over the raw bottom edge and this might happen at the top as well. If you sneeze precipitously especially in a well-worn tightly laced corset, you may split a seam, and/or pop off a stud on the busk. Been there–done that! Don’t panic. If you are a ROMANTASY client, we refurbish well worn corsets at cost plus a bit and you can likely get yet another year of wear or more out of it, even 23.5/7! If you wear your corset on a more moderate basis, then a corset should likely last without need for refurbishment for 2 to 10 years or more! If you have some ideas about how to extend the life of a good custom corset, please pass them on and we’ll publish them here, or just send us a blog comment to add. I recently returned from a wonderful visit with my mom in Atlanta, to celebrate her 95th birthday. Now if this is not a case of someone benefiting from living right and healthily, I don’t know one! But then, it might just be her German-heritage stubbornness that keeps her motivating forward resolutely. Whatever it is, I’ll take it and hope for many more years to share good times and memories with her as we both age. However, I did come up with a burning question that I would like to put to Dr. Oz, the doctor of Oprah Show fame now with his own tv show. He recently echoed a question I raised in my waist training book, and that is, how to deal with moms who force food on us in a most unhealthy way, and possibly re-educate them to express love in another way. I followed up with a question about why moms who love children, would choose to show love by putting this kind of temptation in front of their children– children who might already be overweight and on the way to obesity and ill health. My mom had no answer. Then I tried a possible answer on her to see if it held water. Did moms do this intentionally trying to increase temptation because they wanted to strengthen the resolve and test the logic of their children, to see if their children would resist and refuse, and then ask mom for a healthier option? No, that was not it either. Of course I referenced the national, even international obesity epidemic. Mom agreed that there was one. But she refused to see that her approach at showing love added to the problem rather than help resolve it. She opined that it was our responsibility to resist and not get fat in the first place! Needless to say this frustrating conversation terminated with neither of us fully understanding the position of the other and with no satisfactory answer or response from her to my question and concern. Thus, I am left to conclude that as adults we must act responsibly and employ ultimate logic to resist our mom’s unhealthy temptations and unwise expressions of parental “love”, understanding those expressions for what they are. We need not stuff our faces with mom’s version of love. It takes will power, and politely declining seconds or an unhealthy snack might be misinterpreted by our mom, but we can gently assure her that it is not rejection of her love at all. In the end, it is our ‘end’ that we must take care of to protect and nurture, even when mom doesn’t go about it the right way. This morning I was stunned (why should anything surprise us these days?) to hear Dr. Oz on Good Morning America, discuss a new crash diet sweeping the country. ( I missed it, but don’t much care). It’s called the “Hcg” Diet. Apparently women are injected with hormones (‘Novarel” was one drug name I saw on the tv screen) to trick their bodies into thinking they are pregnant. This apparently dampens hunger, then they eat only 500 calories per day. Doesn’t corset waist training open a “vista of opportunity” for Dr. Oz and other medical professionals to begin to listen to countless corset-wearing folks who report almost immediate reduction of hunger, portion control, better posture, and greater sense of well being from wearing corsets? One month of hormones, according to Dr. Bisson Lionel who is touting the procedure, costs $1150. 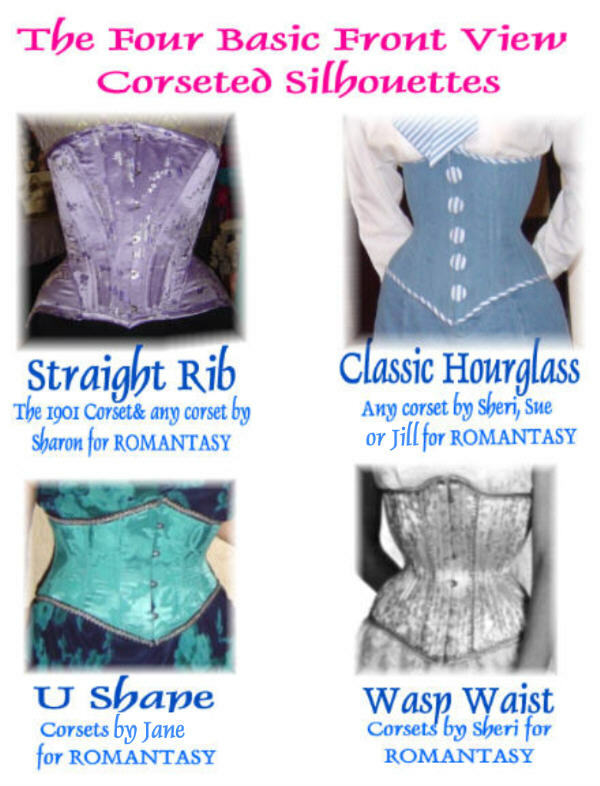 For that you could purchase FOUR sturdy waist-training corsets at ROMANTASY: one to start the program, one for the second month after you drop 1-2″ around your midriff, one more for the final month of the program, and the fourth for the future. Four corsets. Or three, if you wish to doll them up with silk, lace, and Austrian rhinestones — gorgeous corsets at that! Dr. Oz says the new diet is for the short term, only about a month and a half. 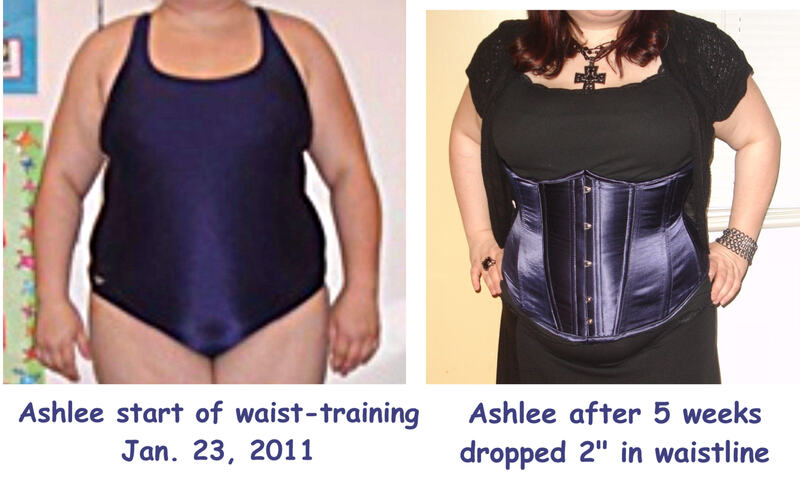 In a month and a half of waist-training six days per week, my current corset coaching student, Ashlee from Birmingham, AL, has dropped 2″ in her waistline. She has dropped only a few pounds — but waist-training does not have to be associated with dropping weight if the student does not want it. In fact, sometimes weight goes up slightly as fat is dropped and muscles build up — muscle weighing more than fat. That’s why I don’t let the student obsess on weight, but concentrate on seeing a downward trend in inches over three months of training. If as Dr. Oz says, “we can’t dismiss something because there is no evidence,” then I suggest that the medical establishment and general public should not dismiss corset waist-training because Stanford or Harvard have not taken on studying the results in a laboratory. Come to think of it, I don’t really want Stanford or Harvard, or the FDA for that matter, to learn about waist training and interpose themselves into the process — they might shut anyone down who gives advice on the web about the magic of corset waist training to reach truly fun and fashionable, plus healthy, results — all in about as fast a time as any weight-loss surgery or drug can do. It’s less invasive, certainly less expensive, and whole lot more fun than popping pills or being cut open to remove fat or install a gastric band. Try it and you’ll see! Present waist training student doing well! Ashlee invested in an in-person muslin fitting (interim corset in cotton fabric) to ensure a good fit, then lost so much weight that we had to shrink her corset a few weeks into training! But that’s a service we offer our clients in our “Client Care Program”, and at relatively little cost. That helps your corset fit you for years and years even if you do lose weight. We just got word out via a press release about Ashlee’s progress to various media, and we’ll keep you posted on her progress. Yup there’s a strong connection. The May/June 2006 issue of AARP The Magazine, contained an article “Eat More Stay Thin” by Brian Good, in which he explored the 10 fat-fighting tricks of the naturally lean. It was the first time I had even been exposed to the concept that lack of sleep is connected to obesity. I was initially stunned, although over the next few years I read a lot more about this topic. Apparently James Maas, Ph.D., professor at Cornell University in Ithaca, New York, authored Power Sleep in 1991, where he reported on research involving a group of healthy men and women restricted to four hour of sleep a night. After six days the subjects’ metabolisms and hormone levels were so “out of whack” that their bodies had a hard time processing glucose in the blood, a problem common in overweight diabetics. A subsequent study looked at people who slept fewer than six hours a night. The sleep-deprived group needed to produce 30 percent more insulin on average, to process their food, a trait that predisposes people to weight gain and increases the risk of obesity over time. USA Weekend Edition on November 26-28, 2010 reported that a small study from the University of Chicago showed dieters who slept 8.5 hours during one period and 5.5 during another lost about the same amount of weight (under 7 pounds) but when they slept more, they took off body fat as opposed to muscle mass. With less sleep time participants also felt hungrier and had higher levels of gherlin in their blood, an appetite-boosting hormone. Maas says that fat cells produce a hormone called leptin, which helps the body keep track of how much potential energy (i.e., fat) it has stored. Leptin production peaks when you’re asleep, and that spike can be interrupted if you deprive yourself of it. This leaves your body with an unreliable measurement of how much energy it has in reserve and ultimately causes it to end up storing calories rather than burning them. Maas also says that another drawback from not sleeping enough is that it’s easy to confuse feelings of fatigue with feelings of hunger, so you end up eating when you’re really just tired. Then, in the July-August issue the AARP Bulletin, I found yet another research study confirming Maas’ position. In an article called “Fighting Fat: Snooze to Lose,” the magazine reported on a 16-year study of nearly 20,000 middle-aged women. The study found that those who slept five hours or less each night were more likely to gain a significant amount of weight than those who slept seven hours. The lead researcher was Sanjay Patel, M.D., of Case Western Reserve University. “Other research suggests similar finding in men,” he said. Then the Jan/Feb issue of the AARP Bulletin referenced yet another study at the University of Chicago who found dieters who slept 8.5 hours for one period and 5.5 during another lost bout th same weight of just under 7 pounds but the composition was different. When they slept more they took off body fat; when they slept less, they lost more muscle mass, which apparently lowers metabolism. Not only that, but on February 7, 2007 while listening to ABC’s “World News Tonight,” I learned of a recent study that connected getting more sleep with reducing obesity in children aged 18 and younger. Fourteen hundred children were studied. They added one hour to their nightly sleep allowance and five years later, weighted 20% less than other children studied. It’s called the “Z” factor and might be relevant to adults, opined Professor of Medicine Eve Van Cauter of the University of Chicago. Perhaps like me you have heard that catching up on sleep doesn’t really work. But now I’m not convinced that’s true. One Sunday in March, 2011, I was reading my Sunday paper supplement, USA Today, and read an article on obesity, sleep, and children (“These three simple lifestyle changes can lower your child’s risk of obesity”). Researchers at the University of Chicago monitored sleep patterns of 300 children ages 4 to 10 for a week and found that those with the shortest, most irregular sleep, had more than a fourfold increased risk of obesity. When they slept in on the weekends to compensate, their risk decreased. I suppose one could joke that if we sleep longer, that is just so many more hours our mouths are shut and we can’t eat. Nonetheless, these are somewhat amazing findings to me, and I now require my waist-training students to carve out time to get at least eight hours of sound sleep as part of their training regime, and pursue ‘catch-up’ time if they can’t. I highly recommend the same to you. “Eat more, exercise less, lose weight” says Dr. Oz, well, maybe! However Dr. Oz’s concept is correct (see SF Examiner Feb. 17 “Healthy Living”). The point is for waist training to start slow an dstead, skipping “boot camp workouts and dramatic calorie-slashing.” Dr. Oz confirms that severe practices puts the body into a panic mode, increasing strss hormones, hunger hormones and causing you to be tempted to binge on high-fat foods. We have to ‘outwit’ our body’s biological imperatives to eat all the food we can get our hands on or see in the ‘see food eat it’ diet! One thing I require my coaching students to do is carry around in their car and purse or pocket, zip lock baggies or health snacks like high fiber easy-to-eat cereal (there are yummie kinds out there with not all that much sugar), or carrot or celery snacks, or health bars (check calories!). For dessert we love the new yogurts coming out on the market in small portions with high flavor impact. They satisfy my sweet tooth for the most part. Dr. Oz recommends a few moments of deep, slow belly breathing as well, but he hasn’t yet addressed the benefits of a tight belt or corset to cut back on portion control. My present student Ashlee, reports less hunger during training and a new habit of better snacking late at night–her former nemesis as seh played on the computer or social networked with friends. With a son to take care of for life, this young mom is motivated to go the distance and try to drop 5 waistline inches and 20 pounds in three months. She’s on the right track — for life! We’ll keep you posted on her results, and welcome to Carl, our newest student starting his training program on March 23! Don’t forget if you order a corset we’ll discount your training program enrollment fee this year by 10% of the corset cost. 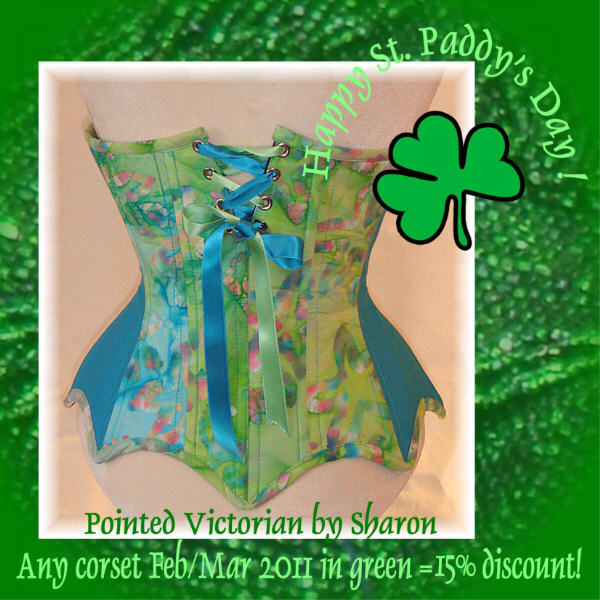 And for March our St. Paddy’s Day special is a 15% discount off any green fabric corset ordered!